The weak pound has prompted many UK skiers to cast their eyes to the east in search of cheaper ski destinations. Skiing in Eastern Europe has been a way of life for years, but in international tourism terms it is still in its infancy. Many Eastern European countries have recently joined the European Union and have since become popular destinations with low-cost airlines. Prices for accommodation, food, drinks, and lift passes are also significantly cheaper. The Post Office Travel Services Ski Resort Report 2010 surveyed 14 ski resorts across Europe and North America. 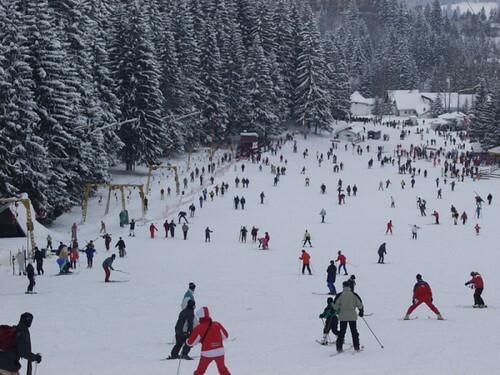 The report investigated the total costs of six days' skiing (ski pass, ski hire, meals, and drinks), and it concluded that Romania and Bulgaria is where holiday money will go furthest this winter. [R2154R, Poiana Brasov] proved best value-for-money destination, with the total costs of six days' skiing coming to £195.76 per person. Poiana Brasov is the country's most popular resort and has the biggest ski area with 14 kilometres of pistes. Advanced skiers may find the pistes limiting, but there are also nine kilometres of cross-country trails to explore. Beginners will find wide open pistes as well as English and German-speaking ski instructors. Apres-ski in Poiana Brasov is lively and good value for money. The wide range of bars, restaurants, and discos feature everything from Romanian folk music to all-night partying. The number one attraction off the slopes is Dracula's Castle in Bran - just a horse-driven sleigh ride away. Poiana Brasov's beautiful natural setting has been compared to Chamonix, France and Cortina D'Ampezzo, Italy. While Poiana Brasov has just 14 kilometres of piste with a top altitude of 1775 metres, Chamonix offers a 155 kilometres of some of the steepest and most challenging skiing in the world, reaching heights of 3842 metres. There's no denying that Chamonix boasts impressive stats, but for beginners - especially those on a budget - Poiana Brasov offers better value for money with a six-day ski pass costing less than half that in Chamonix (£100.20 in Poiana Brasov and £210 in Chamonix). 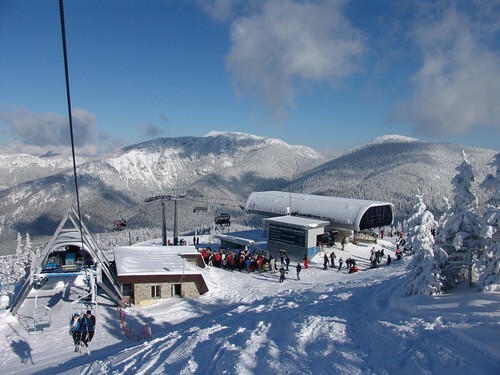 The second best value-for-money resort, according to the Post Office Travel Services, is [R2648R, Borovets] in Bulgaria with the total costs for six days' skiing coming to £250.87 per person. Winter tourists are on the rise in Bulgaria, particularly families on cheap package deals and young skiers seeking lively après ski. Marion Telsnig from TUI Travel says: "Bulgaria offers great skiing possibilities in its resorts, especially for beginners or people still finding their feet on the piste. Excellent value for money and superb après ski for adults and children make it a great family destination." Borovets is Bulgaria's oldest and largest ski resort. 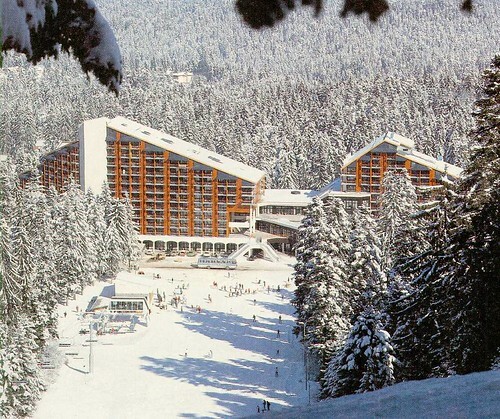 Set at 1300 metres in the Rila Mountains, Borovets is ideal for intermediates and beginners. The attractive pistes are fringed with pine trees and have reliable snow cover between mid December and the end of April. Its 20 runs are linked by a modern gondola and chairlifts, and the town has also twice hosted the World Cup competitions. The ski slopes in Borovets are at a similar altitude to those in Kitzbuhel, Austria. Although Borovets offers one of the largest ski areas in Eastern Europe with 58 kilometres of pistes, this is no match to Kitzbuhel's 168 kilometres which is almost three times the size. That being said, both resorts are considered somewhat limited for expert skiers and best suited to beginners and intermediates, many of whom wouldn't need more than 58 kilometres of terrain. This leading Bulgarian resort also picks up points on price: a six-day pass costs £144.66 in Borovets while it's £170 in Kitzbuhel. Borovets is cheaper than Kitzbuhel off the slopes too, with a good choice of inexpensive, cheerful bars, pubs, restaurants, and discos. Other alternatives to skiing in Western Europe include resorts in Slovenia, Slovakia, Serbia, Macedonia, and Czech Republic. The High Tatras Mountains in Slovakia are home to almost 100 ski centres with 1000 ski lifts and 30 cable cars. Some of the best slopes are found in Chopok [R2791R, Jasna] with a top altitude of 2024 metres. The ski slopes of the High Tatras offer much shorter transfer times than many western European ski resorts: the High Tatras are just 30 minutes from Poprad Airport. The numbers of skiers to Slovakia are on the rise, particularly from the UK and other new markets. Now with low-cost carriers, it's easy and inexpensive to reach Slovakia for a ski weekend. A six-day ski pass in the High Tatras costs £140.69. Slovenia offers a thriving ski scene characterised by traditional resorts, well-groomed pistes, and beautiful lush scenery. Ski resorts here do not suffer from over development instead they have managed to maintain their old charm. TUI Travel's Telsnig says: "Slovenia offers great holidays for families. There is always something to do or go and see in addition to skiing. The areas are uncrowded, picturesque, and unspoilt, and the locals friendly and inviting." Accommodation is of western European standards except at a lower price. English is spoken widely and the country hosts numerous international ski competitions. The most popular Slovenian resorts are [R2360R, Kravavec], [R2585R, Kranjska Gora], and [R2140R, Bled]. A six-day ski pass in Kranjska Gora costs £143.62. Serbia is also making a name for itself as a cheap no-frills ski destination. The main ski resort here is [R2384R, Kopaonik], which offers 60 kilometres of slopes reaching heights of 1770 metres. Almost four million ski passes were bought in Kopaonik alone last season. The resort boasts good snow coverage between November and May and is complete with a lively après ski scene concentrated around the main square. Kopaonik is particularly popular with families seeking a cheaper alternative to resorts in France, Austria, and Switzerland. A six-day ski pass in Kopaonik is the cheapest in Europe, at £50. Macedonia boasts snow cover until the end of May, despite being one of the most southerly countries in Europe. That means it's possible to ski for six months of the year. Macedonia's top ski resort Popova Sapka sits at 1845 metres and offers skiing up to 2501 metres. The large complex is filled with hotels, bars, and restaurants and also hosts the annual International Alpine Skiing Tournament (the Shara Mountain Cup). Popova Sapka is easily accessible, just 30 minutes from the capital and airport of Skopje. A six-day ski pass in Popova Sapka costs £60. The Czech Republic is second to none in the sheer length of cross-country trails that is has to offer. The Krkonos cross-country highway is something of a novelty in Europe as it is comprised of 520 kilometres maintained trails. The Czech Republic may not have the highest mountains in Eastern Europe, but it does offer a wide selection of ski resorts, stretching from the German-Czech border throughout Moravia. One of the best known ski resorts is [R2540R, Spindleruv Mlyn] with skiing up to 1600 metres. It offers 26 kilometres of pistes served by 16 lifts. A six-day ski pass in Spindleruv Mlyn costs £107. Despite the rapid growth and increasingly modern infrastructures of resorts in the east, in terms of advanced skiing they struggle to compete with the giants of the west. Expert skiers are in their element in St. Moritz, Switzerland with its 350 kilometres of pistes reaching heights of 3303 metres. This extensive, high-altitude terrain does come at a price: a six-day pass in St. Moritz costs £183, almost twice the price of Poiana Brasov, Romania. Whether a resort offers value for money or not depends on the level of skier. Beginners on a budget are unlikely to make full use of the extensive terrain in the larger Swiss or French resorts, so maybe better suited to the smaller ski areas of Romania or Bulgaria. The cost of skiing in Europe as whole is on the rise: prices in Borovets have increased by 14 percent since last season; the High Tatras is up by 20 percent; Kranjska Gora 7 percent; and Poiana Brasov 4 percent. Despite this year-on-year increase in cost, skiing in Eastern Europe remains excellent value, particularly for beginners, intermediates, and families on a tight budget.